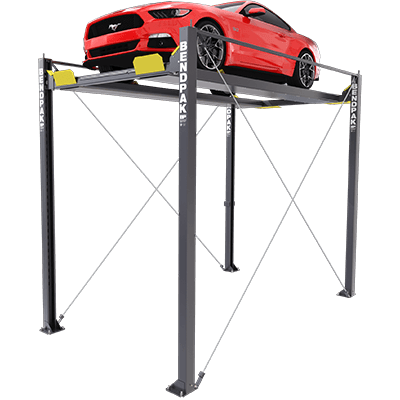 BendPak Lifts – Super Tall Vehicle Display Lift – HD-7MZ – 7,000 lb. Lifting Capacity - Gary Bloom Sales, Inc. The HD-7MZ is a literal giant. 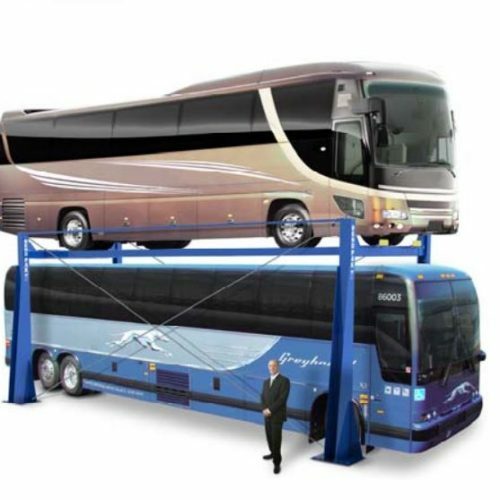 This four-post lift is also a magnificent display platform and will effortlessly lift up to 7,000 lbs. over 12 feet into the air! Specially made for dealers, it’s perfect for stacking taller vehicles and getting them seen! 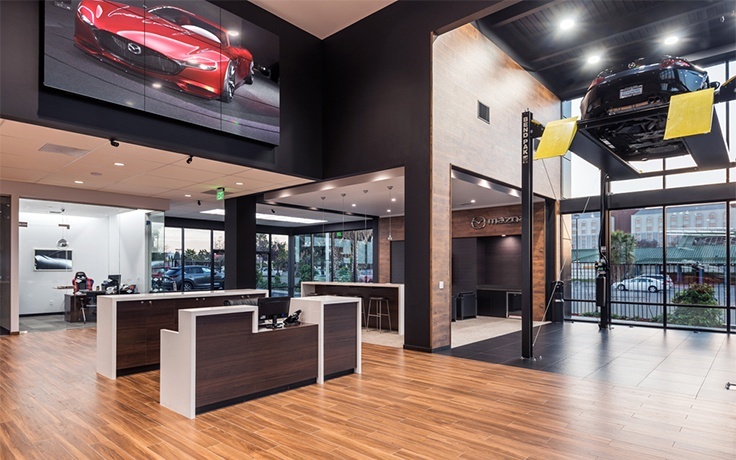 The HD-7MZ was created as the exclusive showroom vehicle display lift for dealerships nationwide. As part of our push to offer dealers better vehicle display options, the HD-7MZ stacks two cars in a “jewel box” glass display in front of their dealership. Attract customer’s passing by on nearby highways or within the main showroom. 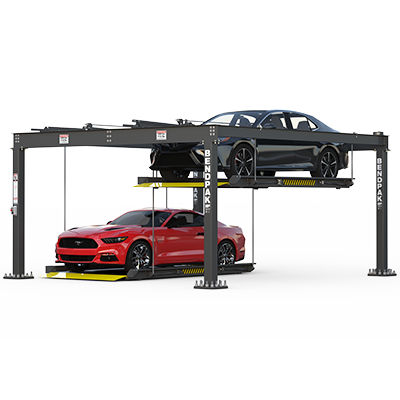 Our specially designed four-post lift features full 360-degree visibility of the car from all sides and includes an attractive low-sheen, rich black powder coat finish. 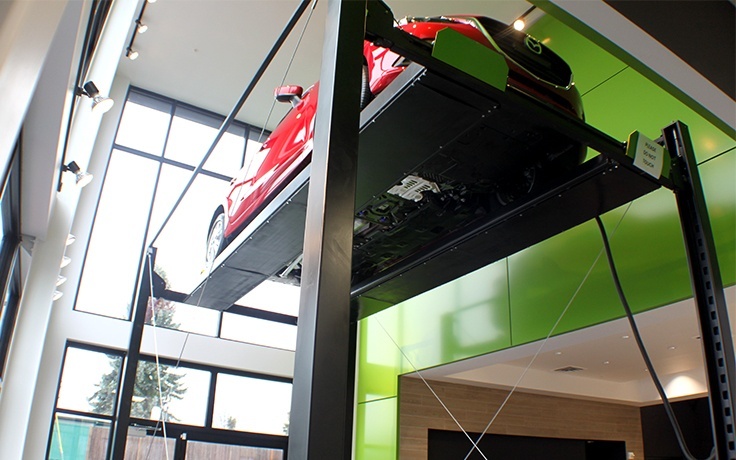 More than just unique styling, this car lift is easy to use and features a platform locking system that safely secures raised vehicles in varied height positions for an open display viewing area. Its hydraulic drive system is hidden under the fully covered platforms for a clean, clutter-free look. 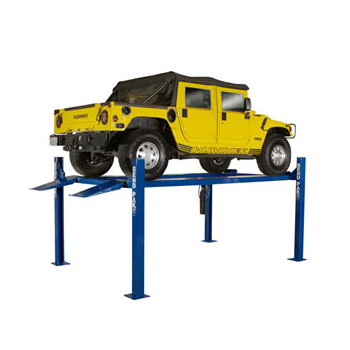 The HD-7MZ four-post lift has a 7,000-lb. lift capacity and 188” long runways to accommodate a variety of vehicle types and wheelbases. 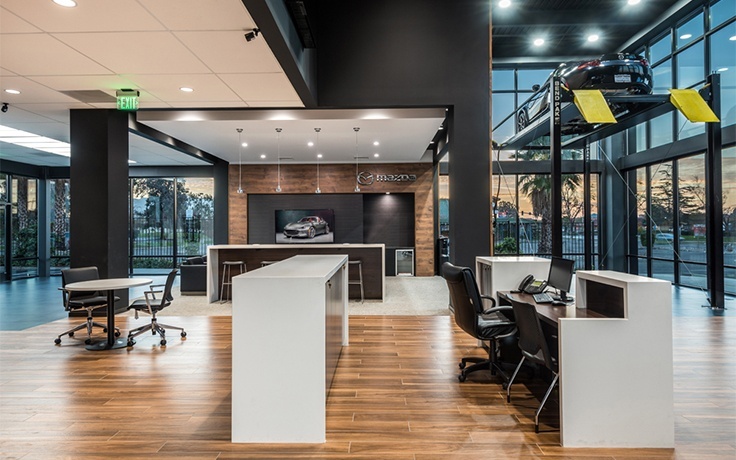 Auto dealerships are always looking for an edge when it comes to their displays. The newest vehicles, or the ones most likely to attract customer attention, need to be prominently shown and visible from the street. The narrow dimensions of this lift, as well as its sleek, low-sheen black coloration, allow it to blend seamlessly into busy lots and showrooms. This way, the vehicles are all that people notice. Its 12-foot high rise is also perfect for getting cars seen from over the highway or across the street. 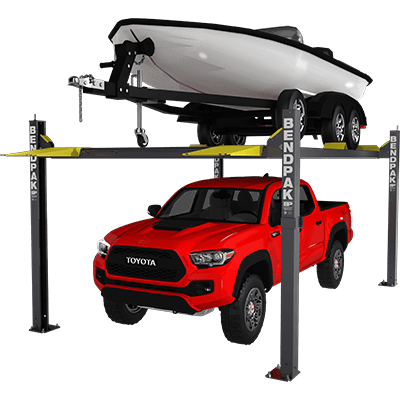 Designed originally for dealerships of any size, this lift is perfect for anyone desiring to gain an edge over the competition. Our job is to help make your inventory look its best, so you can increase your dealership’s foot traffic and close more deals. The HD-7MZ has all the same safety and convenience features as other BendPak four-post lifts. A one-touch pneumatic safety release instantly releases all locks simultaneously, and the lift’s lone hydraulic cylinder is neatly tucked under the power-side runway. Additionally, the entire undersides of both runways are completely covered to improve the aesthetics of the lift when viewed from underneath. Since this lift reaches incredible heights, we felt it necessary to cover up the mechanical and electric-hydraulic componentry. There’s simply no better-looking and higher-reaching display lift on the market than the HD-7MZ.